Because the main objective of this project is to develop and test algorithms and hardware for driver assistance and safety, the AtlasCAR is equipped with a broad range of sensing technologies. The onboard sensors are meant to perceive not only what is happening in the environment, but also within the vehicle. This sensor uses two cameras separated by a known baseline and with calibrated optics. In this case two baselines are available, a short and a long to be used depending on whether the regions of interest are close or far, respectively. The algorithm used to generate a 3D representation applies epipolar search to match pixel properties, and an inverse perspective projection to determine coordinates in space. The 1280 by 960 frames are available at a rate of 15 fps and are transferred via firewire interface and the algorithm runs on the PC. 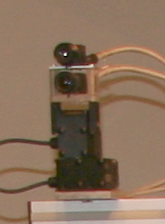 This sensor is composed of two similar cameras, one sitting atop the other, fitted with different optics. Each of these has different viewing angles and focal distances, one has wide angle and the other, the foveal, has a narrow view and thus provides greater detail. 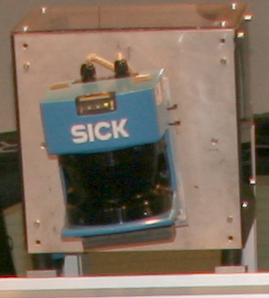 This sensor is used to test vision based attention mechanisms and thus is mounted on a pan-tilt unit, controlled so that the image projected onto the fovea camera always contains the supposed region of interest, and then it is analyzed in detail. The supposed region of interest on the other hand is always determined from the image captured by the camera fitted with the wide angle lens, thus reducing the computational burden. The two 1032 by 776 pixel frame rate is 30 fps and are transferred via firewire interface. The infrared camera is used to allow for safer driving during periods of the day when lighting is insufficient for standard cameras. This sensor captures electromagnetic waves in the infrared region and with it one can more easily detect a person or hot blooded pet. The 320 by 240 frame rate is 9 fps and has been transferred over Ethernet via real time streaming protocol in MP4 format. A small laser scanner, which uses the principle of a continuous, frequency modulated, wave is located at the front of the vehicle. At a low level, it allows for immediate detection of obstacles in front of the vehicle that are sectioned by the scanning plane, at a higher level it is possible to use this sensor to determine the presence of, to follow and predict the motion of objects which meanwhile are classified. Scanning is performed by a rotating mirror and the rate is 40 Hz and the field of view is 270� at a distance up to 30 m but depends greatly on the incident solar radiation. 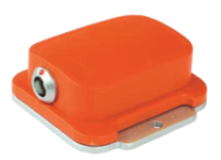 This is a custom sensor, based on a commercial 2D range finder, which uses the time-of-flight principle. The 2D scanner can be configured to provide different resolutions and fields of view. Other than distance to the object, it can also provide the strength of the received signal, which for a given strength of the laser pulse is a rough indication of color. The team generally sets the field of view to 100�, with 0.25� resolution. The scanner is then rotated about an external axis to form a 3D conical field of view. With the said configuration, the 2D scanner is providing measurements at 18 Hz and the full rotation, which can be considered a 3D measurement rate, is usually set to 1.5 Hz and nominal distances up to 30 m. Though data rate is relatively low for a final application, this sensor already provides very interesting data which can be processed to determine geometrical properties of the environment. The actuation of the pedals is sensed by the combined use of 3D low frequency MEMS accelerometers accelerometers . Each pedal has an accelerometer fixed to it and there is an additional accelerometer fixed to the car�s structure, just beneath the pedals, thus enabling one to determine the relative angle by use of the acceleration of gravity. This set has been designed by the team and each board has dimensions of only 12�21.2�5.5 mm. The sensor set has already been tested at an acquisition rate of 10 Hz, but further developments will increase the rate to 50 Hz. This sensor is actually the combined use of a MEMS IMU and a GPS receiver . The first sensor is comprised of three orthogonally fixed accelerometers, three magnetometers and three angular rate sensors, allowing for dead-reckoning during absence of adequate GPS signals. Good GPS reception allows for the correction of the accelerometer bias which otherwise tends to induce large drift into the estimated positions. Though determining the exact position of the vehicle is not important in our case, egomotion compensation is necessary for correct perception of the environment. 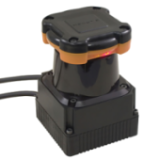 Whilst the installed GPS receiver alone can only provide position and speed over ground at a rate of 1 Hz, the fused sensor set can present corrected measurements at 100 Hz.